A paint’s finish, or sheen, can make all the difference to a finished look and how long it lasts. “Sheen” is simply how shiny or reflective the paint surface will be after drying. The sheen you choose can help you hide minor flaws on your walls, call out architectural details, or make it easier to clean up after the little ones. Paint comes in a wide variety of finishes, from dead flat to high gloss. What you choose depends on the not just the desired finished look, but the amount of traffic in the room, and how scrubbable you need the walls to be. Today, many super-premium products, such as Benjamin Moore’s Aura® paint, offer the same durability and washability in all sheens, so the selection of the finish is more of a personal preference in those cases. 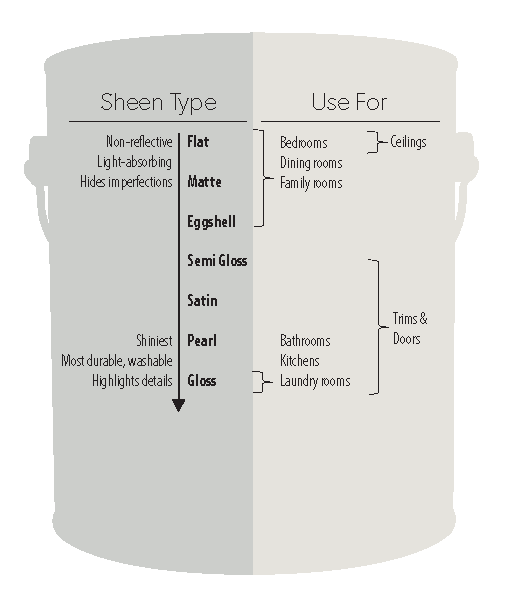 Here is a cheat sheet for selecting your desired finish. When in doubt, remember “sheen is shine”. The higher the sheen, the easier to clean. A flat finish will hide more flaws.